Continuing with the previous chapter’s introduction to emotional conductivity, Kevin expands his theory by talking about unresolved emotion within dogs. Memory is not a cognitive process for dogs nor is it a mental or psychological process of remembering. Instead, “memory” is a here-and-now experience (not process) that is manifested in physical form. A dog who has been beaten its entire life continuously reacts the way it does in part because there is a FEELING – in both emotional and sensory terms – of stored past emotion that is triggered physically by external stimuli. There are no iconic reruns of abusive episodes in its mind, only the physical/emotional feeling it experienced. Its like riding a roller coaster and the only thing you “remember” is the feeling of plunging, twisting, and turning. We “know” that experience more by the way it makes us feel emotionally and physically, and less by what we see (although, for some people what they see on a roller coaster might make them lose their lunch, which in that case would convert into a physical memory of stress). Nonetheless, you might equate unresolved emotion with fear and/or feeling a loss of control which, as Kevin puts it, is the place of “deep inner stress.” This is where he describes the concept of dogs having an emotional battery. Emotion/prey drive that is not run to ground is converted into stress in the physical form. From then on, the dog may generalize from the Big brain, certain aspects of its surrounding as triggers to this stored energy – this creates an overwhelming feeling of vulnerability and exposure to further “trauma,” if you will. 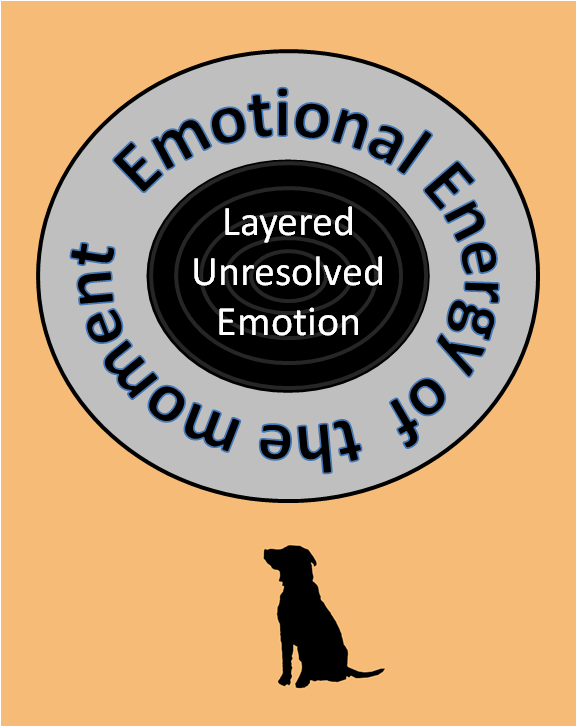 In training, you have to reorient your behavior so that the dog can tune the energy of its unresolved emotion into new energy that increases yet flows, instead of being blocked (which would pile on more unresolved emotion). You have to position yourself emotionally and physically in a way that aligns with the dog (again, physically and emotionally) – creating a sense of “we’re on the same team.” This opens a doorway for the dog to overcome the threshold or resistance created by our predatory human nature (this is a very simplistic way of putting it). The final push of this chapter gets at the heart of it all: our dogs seek to resolve our unresolved emotion. It posits the question: is it our own unresolved emotion that gets in the way of our true relationship with our dogs? There’s nothing the dog needs to do other than to BE in our lives to get us to make the choice to realize those deep, dark eyes are the mirrors of our souls (okay, so that was my own little interpretation). If our dogs are trying to resolve our unresolved emotions, will we choose to be present with those feelings as if we were to look into the mirror and see ourselves through our dogs? There were a number of things in this chapter that elicited my imagination and the picture above is one of those images. This isn’t anything new, but do we realize how much time we spend dwelling, wishing, thinking, judging, etc.? A lot of it, right. Well, Kevin points out later in the chapter that if we can sift through the thoughts and impulses that cloud our true feelings (primal to our existence) then we can move to appreciate the connection we have with our dogs. Can you recall times when you had a crappy day filled with those kinds of thoughts and when you got home you found yourself totally unaware of the emotional impact you had on your dog? Oblivious that your dog was emoting right back you that which was at the core of your heart in that moment only to leave it with ungrounded energy? It reminds me of children who grow up in abusive homes and environments that are not emotionally validating – then they reach adulthood fearful of their very own emotions, judging themselves just because all their life they were taught that feeling a certain way was wrong. I acknowledge that that is not always the case; nonetheless, I know I’m touching on a subject that is sensitive. However, if we are going to be true with ourselves – which, in essence is what our dogs are reflecting back at us – at some point we must allow this human-canine connection to peel back the layers we have. Spoken like a true therapist right? I suppose this is coming from my heart: here you are at this point in your life and you have opened the door to the curiosity about your beingness and that all began with the relationship with your dog. 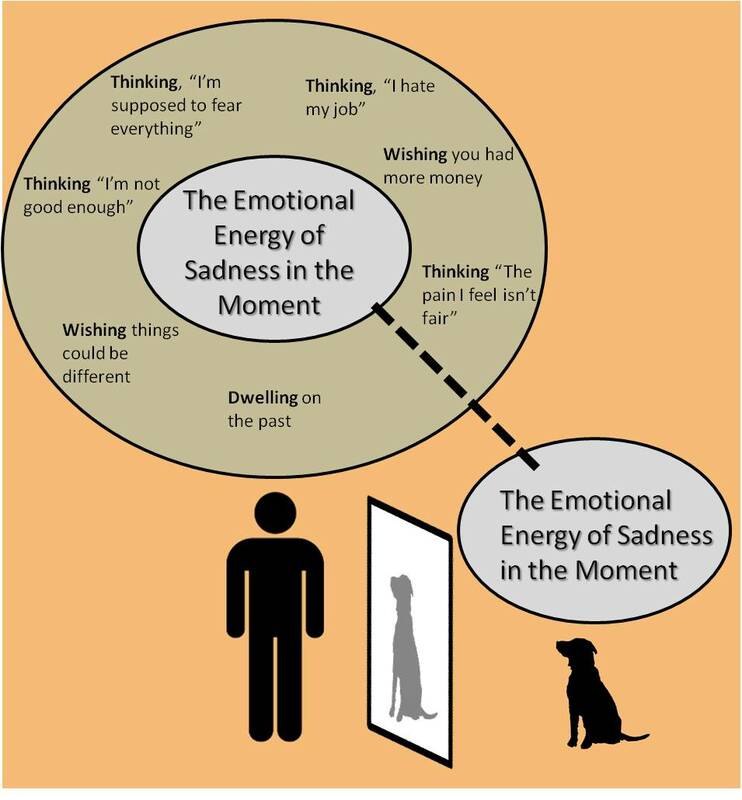 If you take a look at criteria 4 and 5 I think you could bridge the gap between human and dogs in terms of the physical memory of stress/unresolved emotion. I don’t think there is any room to diagnose a dog with PTSD, at least based on the human criteria. My point is that, just like our dogs, even humans beings have a basic response to trauma despite all of the thoughts, perceptions, cognitions, and ruminations that get layered on top of what we experience at the core: raw emotion and the residual physical effects of that energy that was not resolved/grounded. Kevin discusses the idea that “unresolved emotion can get out only the way it went in – it takes an external trigger to become aware of unresolved emotion, and the intensity of specific triggers activates specific layers or unresolved emotion in the emotional battery” (Behan, 2011, p. 146). Without getting too Freudian, it is difficult to access some of our stored stress on our own. This is why therapy is such a successful tool for a lot of people because it takes the emotional charge of another being to give us a frame of reference to approach that deep inner stress. Now, I’m not implying you ought to go out and therapize your dog – good luck with that. Instead, let this be an example that we can be the frame of reference to channel our dogs’ unresolved emotion: its a matter of letting the positive run to the negative and vice versa. Its when we maintain a negative to negative or positive positive in relation to our dogs that prevents us from resolving the stress (and only makes it worse). When I sit with a client for a 50-minute session, there is a pin-pong of emotional energy that allows for the healing and/or discovering process. Ought that be the same for you and your dog in terms of overcoming resistance to the flow of energy? And let’s not ignore the importance of a trigger: have you ever had a person or thing that flipped the switch of an emotional charge from something that happened in the past? Oftentimes we get caught up in that feeling, left not knowing how to deal with it. In my opinion, this is the point where reorienting our frame of reference can help us resolve stored stress (both within ourselves and our dogs). Another therapy example: there’s this concept of transference, where something about the therapist (a word, tone, facial expression, temperament, etc.) triggers an emotional response connected with an object in the client’s life that is holding them back or causing stress or fear. This a point where the therapy can move in a direction of not only 1) resolution of stored stress but also 2) creates an avenue to build a skill for creating new energy and allowing it to flow continuously in their lives. To parallel with NDT, you are addressing the unresolved emotion in a way that teaches the dog to feel grounded with itself. Isn’t this what we want for ourselves too?! So, at this point I have exhausted my reflection but I will leave you with this: not that these images I have created represent what Kevin had in his own mind, I’m curious about your opinions on unresolved emotion. American Psychiatric Association. (2005). Diagnostic and statistical manual of mental disorders (4th ed., text rev.). Washington, DC: Author. Very well put! Enjoyed reading it! Well done!